We recently gave a demo of the Foamex system to our client in some school toilets, with outstanding results! 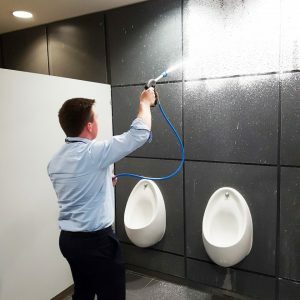 The Foamex system allows for the complete cleaning and sanitising of public restrooms by spraying foam, rinsing, then vacuuming. With benefits such as increased productivity and enhanced cleaning results, as well as reduced detergent, power and water consumption, this system can really help your cleaning regimes! Enhanced cleaning and sanitising results: foam remains on the surfaces that are sprayed which allows full cleansing and sanitising of the surface. Visual effect of foam: foam covers all the surfaces that have been sprayed giving clear indication of which areas have/have not been sprayed. Increased hygiene for the user, who does not come into contact with the surfaces and objects being cleaned. Low pressure spraying ensures there is no splash-back onto the operative. Reduced labour for the user: manual work is reduced to a minimum as the dirt is removed by the chemical action of foam and the mechanical action of rinsing. Increase productivity: Productivity is dramatically increased compared to traditional deep cleaning methods with labour savings of up to 80%. Greater fulfilment is given to the operative as this system is more comfortable and hygienic. Detergent saving: the chemical is used more efficiently as it does not immediately run onto the floor but remains on the wall. Reduced power consumption: the machine requires little electrical power and therefore is convenient to use in any area. Reduced water consumption: the system foam + rinse at low pressure requires a minimal quantity of water. This avoids the ‘flooding’ of rooms, allows a longer working autonomy and offers the immediate availability of the rooms after cleaning. No drain required, as residual liquid can be vacuumed away.